Much of the market gains came on Tuesday as the U.S. played catch-up to the rest of the world after Presidents Day. Monday saw an enormous global rally as Chinese markets re-opened after the Lunar New Year. They rallied in spite of negative trade data (imports down 18.8% y-o-y and exports down 11.2%). Crude had an early week surge as Russia and Saudi Arabia agreed to cap output at current levels, and Iran supported the notion—however, did not express any intention to curb their own output. Crude would finish the week up only marginally as it fell victim to profit-taking and an EIA report confirming continued inventory builds. Of note was the decoupling of equity indices and crude oil, as the broad markets held onto their gains despite the late week swoon in crude. Continued decoupling would be a bullish sign for risk markets so pay attention to that correlation next week. The Nikkei finished the week up 6.8%, all of it coming on Monday, after last week’s freefall (-11%). U.S. Indices spiked on Monday and Tuesday to register their largest three-day gain since August. They spent much of Thursday and Friday digesting gains—backing and filling. Still, retaining much of their gains was a victory for Bulls, who have had little to cheer about in their early 2016 campaign. Economic data was mixed this week, and confirmed the general trend over the last six months. The employment situation in the United States continues to be strong. 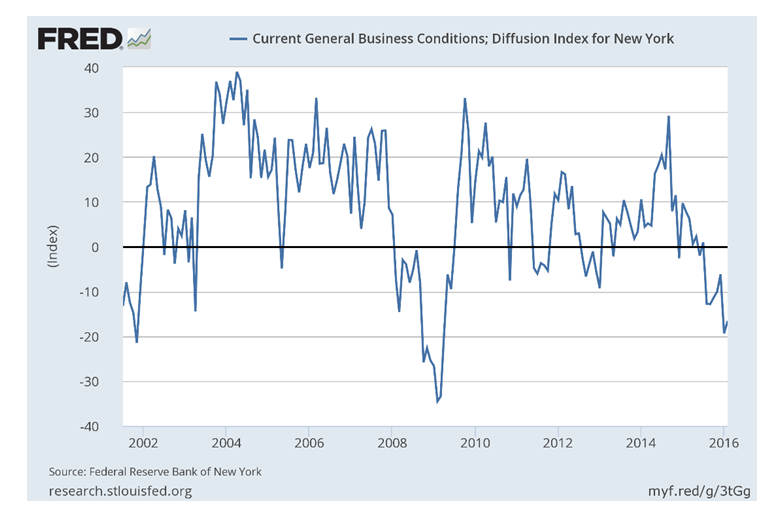 However, manufacturing weakness persists. Tuesday’s Empire Manufacturing Index registered a -16.6. This was a marginal improvement over December’s -19.3 reading, but little consolation and still historically weak. We will get Richmond and Chicago regional surveys next week. Industrial of precipitous weakness. 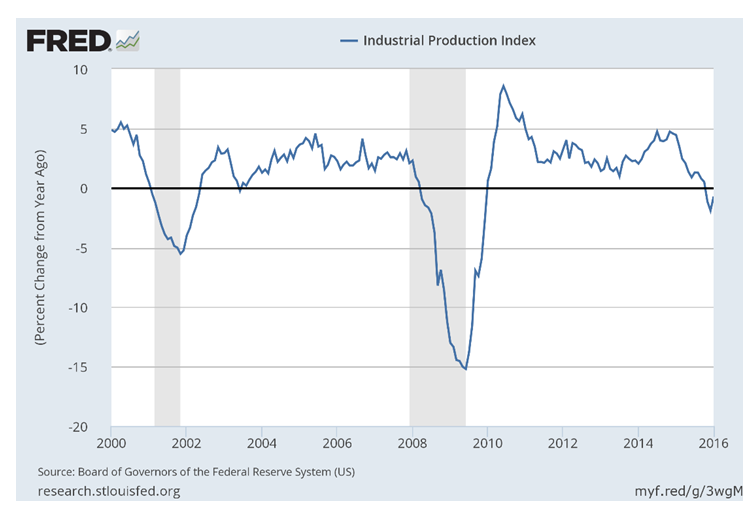 Year-over-year Industrial Production is down .7% and will need another strong reading in February to get back in the black. In any case, Wednesday’s reading came as a relief to the bull camp, who were starting to wonder if manufacturing, mining, and utility output were headed straight off of a cliff. Production numbers on Wednesday were up .9% month-over-month versus the previous month’s fall of .7%. This handily beat consensus expectations of .4% and gave the first indication that manufacturing could be bottoming after two quarters. Price data also came in above estimates for both the PPI (released Wednesday), and the CPI (released Friday). Core CPI is now 2.2% year-over-year and hooking upward out of its seven-year range. Curious since inflation break-even inflation rates are trading at 7 year lows. There is a dichotomy between market expectations and current data–so much so, that inflation data is going to have to come in much weaker over the next year to justify current yields. Overall CPI was higher than consensus estimates and is now increasing 1.3% year-over-year, and above ten-year inflation break-evens. Inflation is gaining steam to the upside in spite of oil being 50% lower year-over-year. If the price of oil stabilizes over the next six months, deflation is going to find itself jumping off newspaper headlines and into the circular file. I have got news folks! We are not Japan. You can read my summary on Japan and its negative rates here. Producer Prices also came in higher than consensus, although they are still running quite cold. Core PPI was up .6% in the last year, and the headline number fell .2% in the same time frame. An interesting note is that the CPI-PPI spread continues to widen(below). Companies are not being forced to pass production savings on to the consumer. 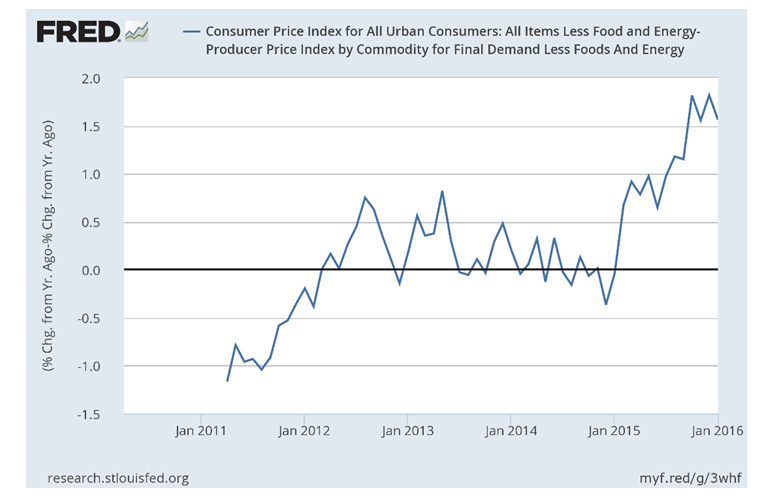 This indicates stickiness in consumer prices and challenges the deflationary argument that has become increasingly pervasive. Initial Jobless Claims continued their downward trajectory, as 262 thousand people filed new claims last week. That is the lowest since October, and only five thousand away from forty-three year lows. With all of the anecdotal references that the U.S. economy is on shaky ground, there is no evidence to support it, at least in the labor market. None. This week was a continuation of last week’s recovery, and a solid victory for the Bulls. Not only were major averages able to hold their gains after posting the largest three-day rally since August, but they were able to do so in the face of weakening crude. Decoupling from crude prices is something that has not happened in quite a long time, and if it continues, it suggests that the “Crude Correction” is over. Technically, there are a couple of positive divergences that imply more than just a relief rally. 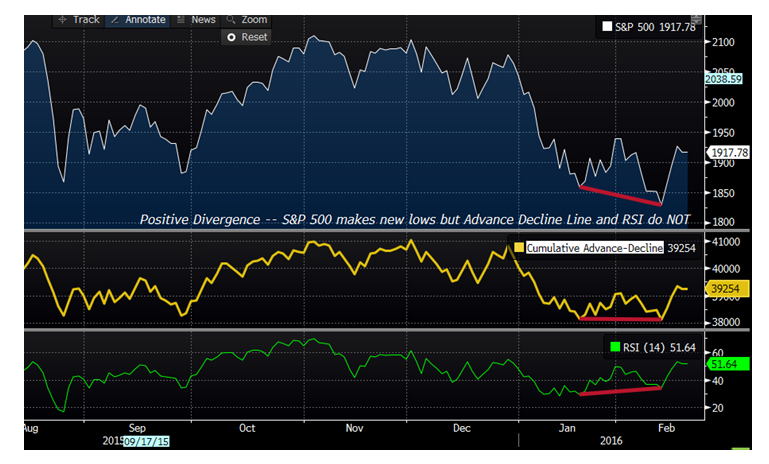 While the S&P 500 made new lows, the Cumulative Advance-Decline line did not. Also, the Relative Strength Indicator did not make new lows either. This market action, against the backdrop of economic data that has not supported the deflationist argument, and improved (albeit still weak) manufacturing data, lead me to believe that the lows for the major market indices are already in. There is still quite a bit of resistance. Fibonacci retracement levels of 1953, 1983, and 2019 are all formidable Maginot Lines, but I suspect they will be breached.